"This was the first major undertaking of our alliance," noted Trammell. "We came together because it is important that we address the issues that face our industry together and with one voice. "With the region's economy showing few signs of recovery, the state searching for solutions to its budget mess, and concerns regarding the environment and sustainability, the GAO funded a study to quantify the impact golf has in our communities. The study, conducted by SRI International of Menlo Park, Calif. was also funded in part by Golf 20/20, an initiative of the World Golf Foundation. "In order to get the attention of decision-makers, it is important that we be able to quantify the contributions of our industry to those that may be affected," added Trammell. "The continued health and growth of the golf industry has a direct bearing on future jobs, commerce, economic development, and tax revenues for a large number of Oregon's communities and industries." 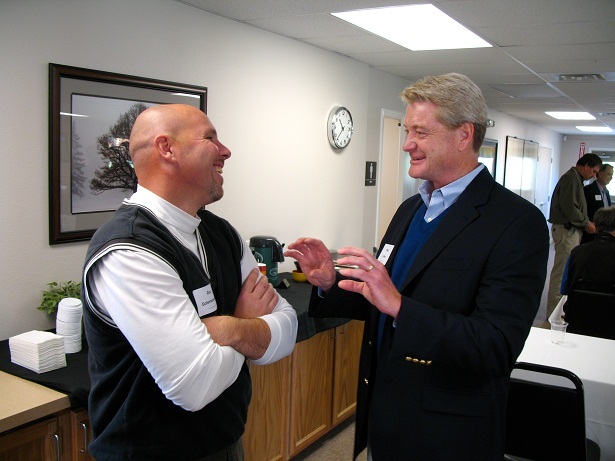 Dr. Peter Ryan, provided details on the project he led on behalf of SRI International and the World Golf Foundation. 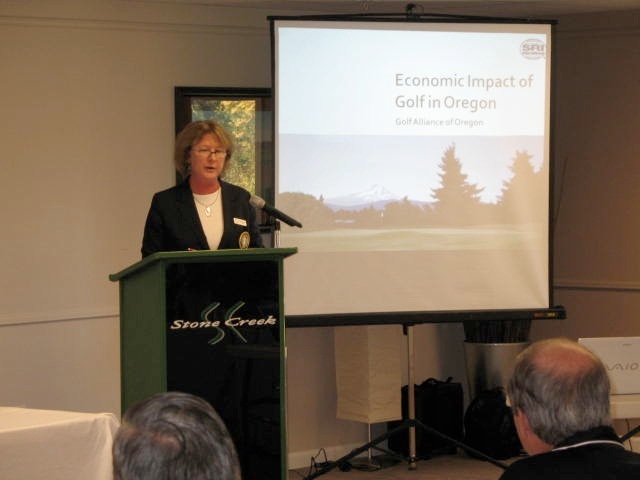 "The importance of golf in Oregon extends beyond the golf facilities themselves. 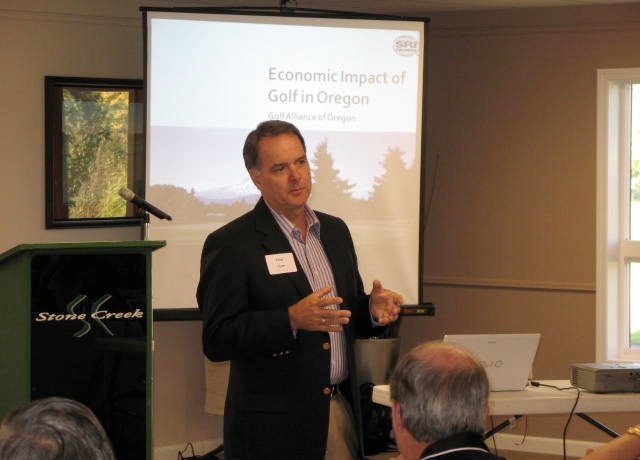 With $1.2 billion of direct economic activity in 2008, the sheer size of the game of golf makes it a major industry in its own right and a significant contributor to Oregon's economy," said Ryan. "That makes Oregon's golf industry revenues comparable in size to other important industries here including paper manufacturing ($3.7 billion), software publishing ($1.4 billion), and even the greenhouse and nursery business ($0.9 billion). "In total, Oregon's golf industry generated an economic impact of $2.5 billion, supporting nearly 27,200 jobs with $703.6 million of wage income," he said. "Golf is an essential component for many local charities and their fundraising efforts," added Trammell. Charitable events hosted on Oregon's golf courses benefited local non-profit organizations with $28.5 million in charitable giving attributed to the game of golf. "Our industry, including golf course owners, club managers, and golf professionals, are happy to serve as access points for fundraising by local service organizations," said Trammell, who also noted that golf is the only private-sector industry to provide free or significantly discounted fees to high school athletic programs. Golfer supplies represented the largest golf industry segment (owing to Nike Golf's headquarters in Beaverton, Ore.) amounting to $464.6 million, followed by golf facility revenues totaling $361.7 million and golf-related hospitality and tourism at $221.8. Real Estate also is benefited by golf. "In 2008, a tough economic year, golf-related residential construction contributed $62.2 million to the state economy, and a "golf premium" generated by sales of existing golf community homes was $11 million," noted Ryan. 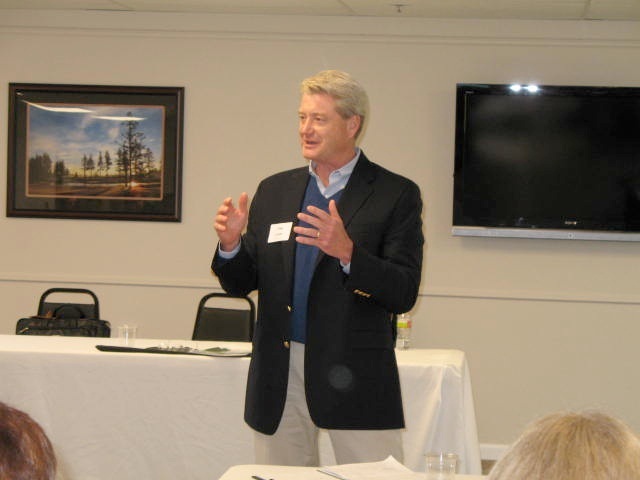 Gregory T. Lyman, Environmental Programs Director for the Golf Course Superintendents Association of America discussed golf's focus on stewardship of the environment. "Golf courses provide diverse habitats for a range of wildlife, and Oregon golf courses take their environmental stewardship seriously," said Lyman. "Your state should be proud that it leads the country in the number of Certified Audubon Cooperative Sanctuaries." There are presently 19 golf course certified sanctuaries and Tetherow in Bend, Ore. is Bronze-level signature sanctuary. Led by the Oregon Golf Association, which represents the most avid golf consumers, the Golf Alliance of Oregon is comprised of the major industry associations for the region including the Oregon Golf Course Owners Association, Pacific Northwest PGA - Oregon Chapter, Oregon Golf Course Superintendents and the Club Managers of Oregon. To download the two documents associated with the economic impact study, visit www.oga.org/docs/eis/Oregon-EIS-Summary.pdf for the executive summary and www.oga.org/docs/eis/Oregon-EIS-2010.pdf for the full study.